A trio of award-winning, bestselling skincare favorites for a smooth, radiant, younger-looking complexion. Fight the appearance of dark spots and discolorations and discover clear-skin radiance with three advanced, complimentary technologies: lactic acid, vitamin C, and alpha arbutin. 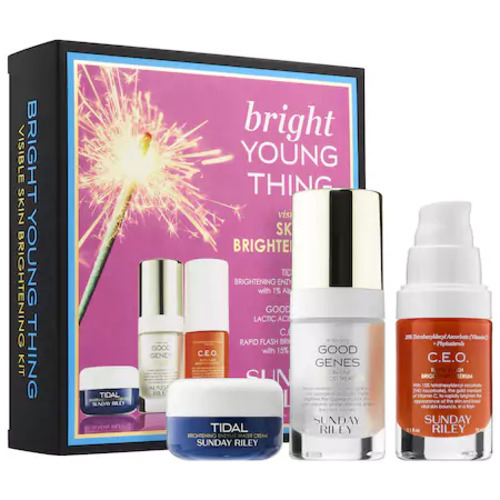 The Bright Young Thing set immediately gives the skin a vibrant, youthful, healthy-looking glow in just three steps thanks to this award-winning, bestselling trio. Tidal Brightening Enzyme Water Cream infuses the skin with healthy hydration thanks to two forms of hyaluronic acid, while brightening the signs of dark spots with one percent alpha arbutin. Good Genes Lactic Acid Treatment clarifies and exfoliates the skin with lactic acid, while visibly brightening with licorice. C.E.O. contains 15 percent advanced, stable vitamin C to brighten the appearance of discolorations and provide antioxidant protection for a healthy-looking glow.